Do you understand these words as you’re reading them? Did you answer yes to both of these questions? You don’t deserve access to this in your native language. A letter was sent hom e with a 12 year old Deaf student, admonishing her for “doing sign language after being told it wasn’t allowed on the bus.” The schools district attorney continues to insist that there are no rights being violated, when the case can be made that school officials are violating the ADA (Americans with Disabilities) Act. Now I was under the assumption that absurdities such as this one don’t occur anymore; how wrong I was. I cannot comprehend the reasoning behind denying someone such a fundamental human right: their right to ACCESS, their right to LANGUAGE. Freedom of expression. Taken away by those who have absolutely no right to do so. The only redeeming part of this story is that the child’s parents are planning on suing the district for infringing on her rights, which means this child has access to a proper language model at home. You don’t ask a Spanish student to stop speaking in Spanish. You don’t ask a Chinese student to refrain from using Mandarin. 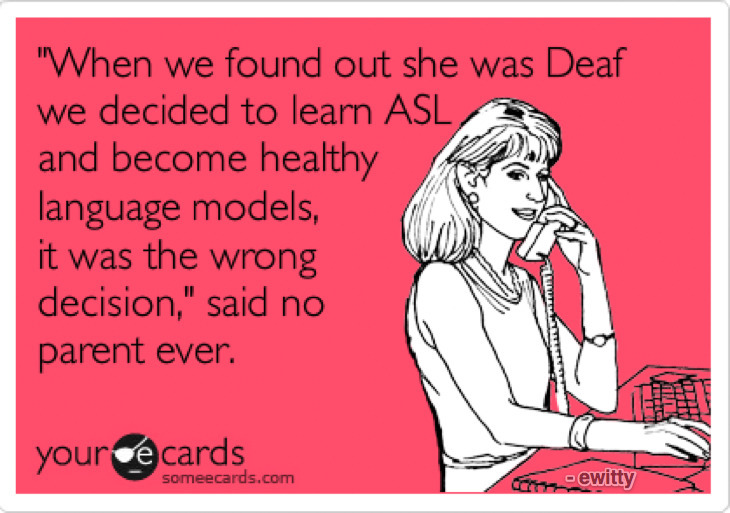 So why force a Deaf student, who cannot hear and has been using ASL to communicate her entire life, to stop using ASL? No matter what your native language is, you should be able to communicate in whichever way you choose. Period.